No Limit Hold Em (NLHE) is an exciting game. It gives you the ability to bet as much as you want, when you want. No Limit Hold’em can be a very tricky game to play well when first starting out. The most important thing to remember is that experience is king. The more you play, the more you will learn, and the more comfortable you will get with every situation. Here are some basic strategies and things to remember before making the jump into the No Limit Holdem online poker world. There are literally thousands upon thousands of people playing online poker, and the chances of all of them behind proficient in the game is pretty low. When in an online lobby like Full Tilt, you want to pick tables that have a high percentage of players seeing the flop. This tells you the players are loose and probably playing too many hands. Recognize this, and use it to your advantage. NLHE Strategy: Pick tables that have a high % of players seeing the flop. Poker players online, especially newer ones are quite clueless as to how important position can be in NL Hold’em. Use your basic poker knowledge here; understand that when you are in a hand in late position, you can play more often as you will be able to see the rest of the table act before you. Learn to play less in early position and more in late position and your bankroll will thank you. When playing No Limit Hold’em online, too many hands are getting played for a raise. When the action comes to you, and you are holding a mediocre hand, like Js-Qh, and you are calling someone’s raise, you are playing too many hands. Inevitably you end up calling raises with poor hands only to fold on the flop anyway. Learn not to do this early in your poker life. NLHE Strategy: Learn to fold mediocre hands. Monster hands (good hands in NL Hold’em) can be tough to come by in poker, and when you get them, you need to push them for all that they are worth. As stated earlier, people love to overplay their hands, and by pushing the action when you have a big hand, you make them pay for it. In other words, put the pressure on the others in the game by being aggressive with your hand. This is especially important in No Limit Hold’em tournaments. NL Hold’em Strategy: Push the action when you have good hands. 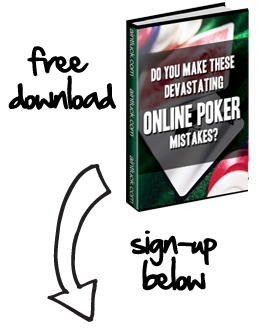 Online poker is a game of numbers and odds, and you always want to know where you stand. Be aware of how much is in the pot when involved in a hand, this will allow you to know when you become pot-committed, and allow you to calculate various odds that you will want to know. The size of the pot will also dictate how you play your hand. Watch out for people who are examining the pot, looking for the perfect value bet to make against you.